This book will appeal to makers drawn to the slow-stitch movement, improvisational quilting, and anyone who appreciates a laid back, cozy decorating style. Wabi-sabi is a Japanese tradition embracing imperfection. The author borrows from this concept encouraging readers to use fabrics already on hand and not to worry so much about matching or coordinating. Lewis offers 20 scrappy projects in varying degrees of difficulty with lovely photos. She even includes inspiration for mending clothing, to give worn favorites new life and character. 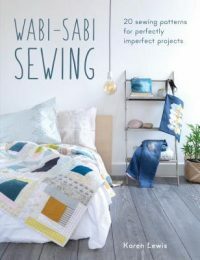 If you’re itching for a reason to pick up needle and thread Wabi-Sabi Sewing probably has a project for you.